Mercedes has given its GLC Coupe a mid-life refresh, bolstering its range of engines while sharpening the car’s looks. The new-look Coupe leads on from the regular GLC, which was also facelifted recently. The front of the car now benefits from a larger diamond radiator grille, which sits in between larger side air intakes. Standard-fit LED headlights sit either side of the updated grille, too. 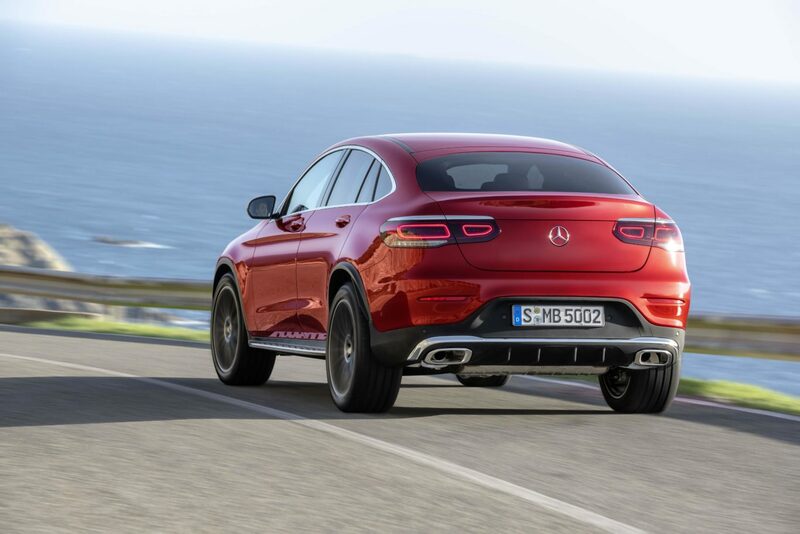 The sweeping roofline of the original GLC Coupe has been maintained, but now leads into restyled rear lights and a newly-designed rear diffuser. A series of new 2.0-litre four-cylinder petrol engines will be available from launch, along with Euro 6d-compliant diesels. The 207bhp GLC200 4Matic, along with the 267bhp GLC300 4Matic also include Merc’s latest EQ Boost technology, which uses a 48-volt starter-generator to improve power response. It can also reclaim energy for better fuel economy. Three diesels – the 200d, 220d and 300d with 161bhp, 191bhp and 242bhp respectively – make up the selection of oil-burners available on the GLC Coupe. A suite of cutting-edge safety assistance systems are included too, with features such as tail-end-of-traffic-jam function, exit-warning function and emergency-corridor feature all coming alongside the standard offerings. The GLC Coupe also gets Trailer Manoeuvring Assist, which helps when reversing a trailer. The next generation of the successful #MercedesBenz #GLC #Coupé skillfully and intricately combines the sportiness of a coupé with the functionality of an SUV. Inside, the GLC Coupe benefits from a 12.3-inch digital dashboard, along with either a seven- or 10.3-inch infotainment display running Mercedes’ latest MBUX software. Full pricing and specifications for the GLC Coupe have yet to be revealed, along with a release date.